Telling you it's a good time to be a comic book fan is like telling you oxygen is a helpful thing to inhale. You know this already. It's just a fact. We've been treated to some of the best, most thoughtful, and most fun comics of all time over the last several years, and that's clearly not going to stop in 2014. Here are a ton of series that you need to be on the lookout for every time you hit the comic store this year. The Firefly saga continues in this new comic series from Dark Horse. Set months after the events of the Serenity movie, Zoe's pregnant, River's the new pilot, and the dangers are greater than ever before. The gods only know what's going to happen to the U.S. release of the movie, but at least we can read the original French graphic novel Snowpiercer, courtesy of Titan. The story is about the last remnants of humanity, stuck on a train that continually circles the earth, where the elite live in the front cars and the downtrodden toil in the back. The comic actually ran from 1984-2000, so to get this epic story in its full epicness, you'll need to check the comic out. The reprint of Alan Moore's seminal relaunch of Miracleman, née Marvelman, returns to comics in all-new editions from Marvel with nary a mention of Alan Moore himself (as per his request). Before Watchmen, before The Dark Knight Returns, Miracleman was the tale that first defined the stories comics could tell. Due out tomorrow, January 15th! It's the beginning of the end for Mike Carey and Peter Gross' wonderful Vertigo The Unwritten, as Tommy Taylor returns to reality — and no man, beasts or story will get in his way. This 12-issue series will wrap up The Unwritten saga by the end of the year. IDW's newest event brings The X-Files' Mulder and Scully face-to-face with the other stars of IDW's comics, including the Ghostbusters, the Teenage Mutant Ninja Turtles, and more. If you don't want to read a comic where Mulder, Scully, Venkman, Stantz, Zeddemore and Spengler all hang out with each other, we can't be friends. From Alyssa Milano — yes, that Alyssa Milano — comes this comic about two computer programmers who run the social network site YourLife while secretly working as hacker-crusaders to fight tyranny across the globe. From Boom Studios. All ready much-acclaimed (and much-reviled amongst people who think that Americans who happen to be Muslim should not be allowed to be fictional superheroes), the all-new Ms. Marvel features a young girl from New Jersey who wakes up to discover she has some pretty considerable powers. Written by Willow Wilson, best known for her award-winning graphic novel Cairo. What if all people of royal blood had superpowers — the purer their blood, the more power they had — and fought for their respective countries in World War II? There's nothing about the premise of this new Vertigo series from Rob Williams that I don't like. The Norse god of mischief — in his younger form — is Asgard's secret weapon in this new Marvel series, in which Loki takes on missions from the All-Mother, including the apparent murder of Thor! Man, Loki should send Tom Hiddleston a thank you card. Greg Pak is known for some of the best action comics in the business — Planet Hulk, Incredible Hercules, the new Action Comics — and now he's getting his hands on the classic '90s character and a bunch of angry dinosaurs in this relaunch from Dynamite. There's nothing wrong with that. Yes, Neil Gaiman's Sandman prequel began last year, and the second issue was immediately delayed until February of 2014. The thing is, the first issue was so good — especially thanks to J.H. Williams III's phenomenal art — that it's worth reminding you to pick the second issue up when it finally becomes available. Hopefully #3 comes out on time. Boom Studios is releasing four new Robocop one-shots, all based on the new movie, in February, but none more intriguing than Beta. If Alex Murphy was the first successful Robocop, that means there were failures before him. Writer Ed Brisson takes a look at the very first Robocop test subject. Superman's ex-gal pal takes the spotlight in her own comic — a one-shot, alas — as the reporter must deal with her general father's grab for power, her sister's drug problems, and her own issues with Brainiac. He's an Agent of Asgard over at Marvel, but at Boom Studios, he's a rock star. When Odin banishes the god to earth, Loki finds a planet full of kindred spirits… and an electric guitar. Again, he should also probably send a thank you card to Tom Hiddleston. Mark Millar's new comics isn't just a space fantasy, although it is that. It's also the beginning of his Millarworld Universe, (i.e. his personal version of the Marvel U). Millar calls it "Buzz Lightyear meets Unforgiven," as a Flash Gordon-style hero returns to Earth, gets married, has kids, but then is needed 25 years later to save the universe one more time in this Image comic. In Dark Horse's continuation of the hit TV series, Buffy is now finally back to fighting vampires, but these vampires are smarter and more powerful than ever before. And all her messing around with magic over the last two "seasons" is about to have some extremely dire consequences. Rush's hit concept album already inspired an epic novel about a young man in the land of Albion, who gets caught up in a war between order and chaos, and whose adventures include airships, pirates, and the titular Clockwork Angels themselves. Now Kevin J. Anderson's novelization of the album's conceit comes to comics courtesy of Boom. Gail Simone not only writes some of the best heroines in the business, but is also a fan of Tomb Raider. So there's very possibly no one better on the planet to bring Lara Croft back to comics, in this new series that continues Lara's globe-trotting adventures set after the most recent game. Moon Knight. Warren Ellis. Two dangerous lunatics that are almost certainly going to go perfectly together in this new Marvel series. Ellis plans to use Moon Knight's craziness to his advantage, wrapping up all Moon Knight's various identities into his multiple personality disorder, while fighting crime in ways even Batman would think is nuts. Dynamite already re-imagined Steve Austin for the modern world with Kevin Smith's The Bionic Man, but now they're going back to the source material with this series that picks up exactly where the hit TV series left when it went off the air in 1978, as Steve and Oscar Goldman battle rogue agents of the OSI. Greg Rucka is already killing it for Image Comics with Lazarus, so I can see why they'd want to get him to write more for them — and the result is this comic, about a young woman who wakes up in a subway with no memory, but an ability to make anyone who tries to hurt her very, very dead. Just like Warren Ellis was very possibly born to write Moon Knight, it's conceivable that writer Dan Slott and artist Mike Allred were put on this earth solely to make a Silver Surfer comic. Now they are, tasking the former herald of Galactus to the wildest, weirdest corners of the Marvel universe. April is a big month for Marvel, but there's likely no news bigger than the fact that Peter Parker is coming back and taking control of his body in the much-anticipated return of The Amazing Spider-Man. But how is Peter coming back exactly? And what's happening to Doc Ock? 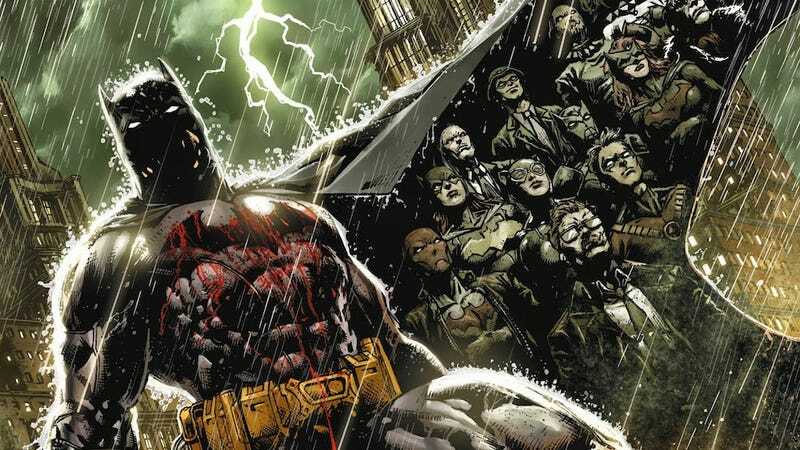 Given that Scott Snyder's Batman series has been one of the major highlights of the entire New 52, a weekly series focused on Batman, his allies, his enemies, and even the ordinary people of Gotham — overseen by Snyder — sounds phenomenal. Marvel is relaunching their Ultimate universe, and it's not a superficial change — best evidenced by The All New Ultimates, which ditches Cap, Thor, Iron Man and more for Miles Morales, Cloak and Dagger, Bombshell, Kitty Pryde and Black Widow. And be on the lookout for Ultimate FF and Miles Morales: Ultimate Spider-Man, too. The mind behind the hit Mind MGMT, Matt Kindt, takes a look at the heroes of the Rebellion through the eyes of normal people that work with them as they head out with new partners to separately to perform parts of an important mission. From Dark Horse. Marvel's martial arts master returns in this new series written and drawn by the impeccable Kaare Andrews. When the mystical city of K'un-Lun is under siege, Danny Rand must return to the place of his rebirth, and his father's death — but what he finds there is a secret he was never supposed to find. Evan Dorkin's quasi-lovable group returns! When Bill's job at the comic store starting tearing the group apart, the Eltingville Comic Book, Science-Fiction, Fantasy, Horror, and Role-Playing Club calls it quits. Unfortunately, these guys don't quit with dignity as much as they do with a scorched earth policy. The JLA moves north following the events of Forever Evil (and thanks to writer Jeff Lemire). New members include Adam Strange, making his first appearance in the New 52, Animal Man, and a new Cree hero based on real-life Attawapiskat First Nation activist Hannen Koostachin, who sadly died in a car accident in 2010. First announced way back in 2006 (really! ), Paul Dini has finally finished his adventure starring DC's mistress of magic and its vocal vigilante, who team up when someone begins killing the members of a gang Canary once infiltrated… and the main suspect looks like the gang's leader, who's been dead for over a year. Batman Eternal won't be DC's only weekly comic in 2014; The New 52: Future's End, is the other, which looks at DC's New 52-inverse through its past, present and future — through Frankenstein, Firestorm, and Batman Beyond, respectively. Marvel's stages a murder mystery on the moon in their new summer event. The Watcher is dead, and the murderer not only stole some of the Marvel U. 's most powerful artifacts, but countless secrets the world's heroes want hidden— secrets that some of them would do anything to protect. The first superhero union arrives in this Image comic, courtesy of Kyle Higgins, Alec Siegel and Rod Reis. Set in the '60s, the Chicago Organized Workers League must deal with the city's government, a disillusioned public, corruption, reporters, and even a few supervillains! Based on the hit horror anthology, V-Wars is set in a world where vampirism is a virus that affects people different based on their genetics — meaning a wide variety of vampires are fighting (and eating) the human population. Bram Stoker award-winning horror writer Jonathan Mayberry writes the comic for IDW. A women in prison movie… set in space… which is actually a comic written by Captain Marvel's Kelly Sue Deconnick? YES, PLEASE. Deconnick's promises to match the sexploitation of the genre with actual feminism, and if anybody can do it and make it wildly entertaining, she can. Grant Morrison's epic DC project looks to finally come out this year, and it sounds like it was worth the wait — it's a nine-issue series where the first and last issues make up one story, with seven tales of alternate universe inside — which are still connected to the overall plot. There's a story about Superman landing in Nazi Germany, for goodness sake. Yikes. We've mentioned it several times, but Dark Horse's relaunch of its Alien, Predator and Alien Vs. Predator comics has us all a-tingle, especially now that the writers are working together to ensure a coherent canon — one all tied together by the launch of Prometheus #1, too. The two '80s juggernauts meet again in this brand-new series from Tom Scioli and IDW! IDW calls the story "cosmic in scale," which I think means somebody's taking a trip to Cybertron. The retro-fantastic art for Sciolo is absolutely perfect for bringing this nostalgia-fueled epic to life. Everyone's describing Titan's Adler as The League of Extraordinary Gentlewomen. I hate repeating that, but there's no better way to describe it, as Sherlock's nemesis/love interest Irene Adler and the most kickass female characters of Victorian literature join forces. This is not a relaunch of the 1940s hero turned public domain character… at least not exactly. Writer James Robinson (of Starman fame) and Greg Hinkle are writing a story about themselves trying to relaunch the 1940s hero Airboy, bust with way more booze, drugs, and mayhem. From Image. And Grant Morrison's other long-in-development DC project — Wonder Woman: Earth One — is also set for a 2014 release. This story re-imagines Wonder Woman in terms of her Amazonian heritage and her feminism, as Morrison tries to imagine what a true feminist utopia would look like — and how its emissary would clash with the modern world. This is not one of those American manga-style series that come out every so often: This is an authentic sequel to Lone Wolf and Cub, written by the original manga's creator Kazuo Koike. Set immediately after Ogami Itto's deadly duel at the end of the original comic, this new series follows his young son Daigoro, now on his own. An intriguing scifi comic from Image about a future where radiation has forced humanity to live in underwater cities. Now a probe with information on a new planet they can move to has returned, but it's landed on the surface — and representatives from the warring clans of humanity must work together to recover it. Noel Clarke — you may remember him as Mickey in a little show called Doctor Who, or perhaps for his turn in Star Trek Into Darkness — heads to Titan to pen this superhero thriller with outstanding art from Yishan Li. It's the first story in a whole superhero universe imagined by Clarke! Grant Morrison is saying pretty much nothing about the plot of Nameless, his upcoming horror comic from Image, but he has said this: "We're taking all the dark stuff that Western culture's kind of obsessed with — the zombies and everything — beyond the limit and doing hopefully for now what H.P. Lovecraft did for the wartime generation." That, all by itself, is kind of terrifying. Valiant's next crossover begins with the return of Armor Hunters! A group of alien warriors are determined to destroy the X-O Manowar armor, and they don't care if the entire planet gets in the way — can the combined might of the Valiant universe stop them? Fables' Bill Willingham heads to Image for this tale of magic, gods, and monsters escaping from the prison they were put in long ago, and returning to the world. Now humanity wants everything locked back up — but the newly empowered gods aren't quite so interested in giving up their new freedom. Sally loves her shotgun. Sally does not love atomic monsters, mutant cannibals, "Crawgators" or all the other things she has to kill while living in the crazy post-apocalyptic madness of New Orleans. From Titan. Everything you think you know about witches is wrong, and Scott Snyder's going to prove it to you with this horrific new Image comic.